Google Spreadsheets is the new web-based spreadsheet application that's giving Microsoft Excel a run for its money. With Google Spreadsheets, you can create complex spreadsheets online, using any web browser, complete with sophisticated formulas and functions. You can even share spreadsheets online and perform collaborative editing on those spreadsheets with other users anywhere in the world. And the best thing is, Google Spreadsheets is completely free! 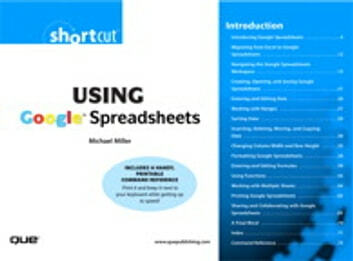 Using Google Spreadsheets is the first e-book to cover Google's innovative online spreadsheet program. You learn how to create new web-based spreadsheets, upload and work with existing Excel spreadsheets, create complex formulas, apply a variety of formatting effects, and let other users share and edit their spreadsheets. Delivered in Adobe PDF format for quick and easy access, Using Google Spreadsheets includes everything you need to create your own sophisticated online spreadsheets. It also includes a detailed reference to the more than 200 functions included in the program, and a great cheatsheet you can print off and refer to for quick reference.